'Nico is not going quietly' mused Damon Hill afterwards. And he was spot on. It's been a recurring theme of F1 in 2014. Along with that whatever else has occurred, on the Saturdays Nico Rosberg has been the man. 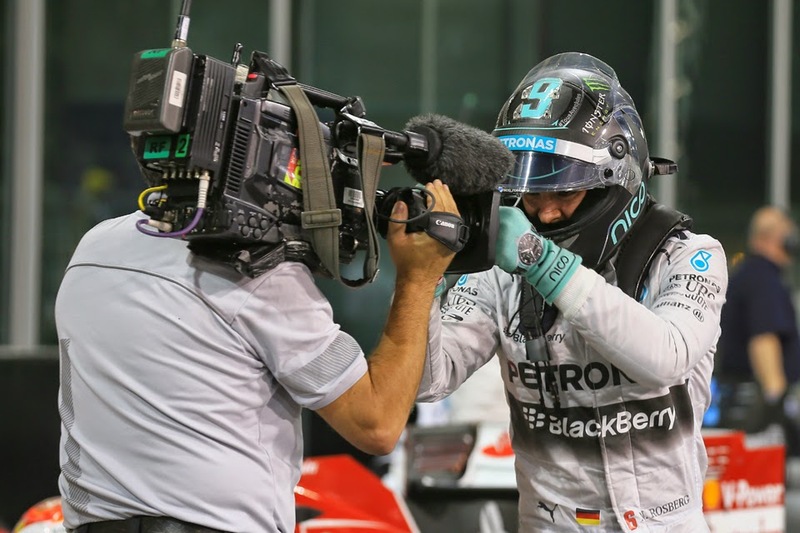 In the season's final Saturday in Abu Dhabi he was the man again, claiming another pole position. And this was a scrum won against the head, as for much of the weekend it seemed Lewis had matters well in hand. 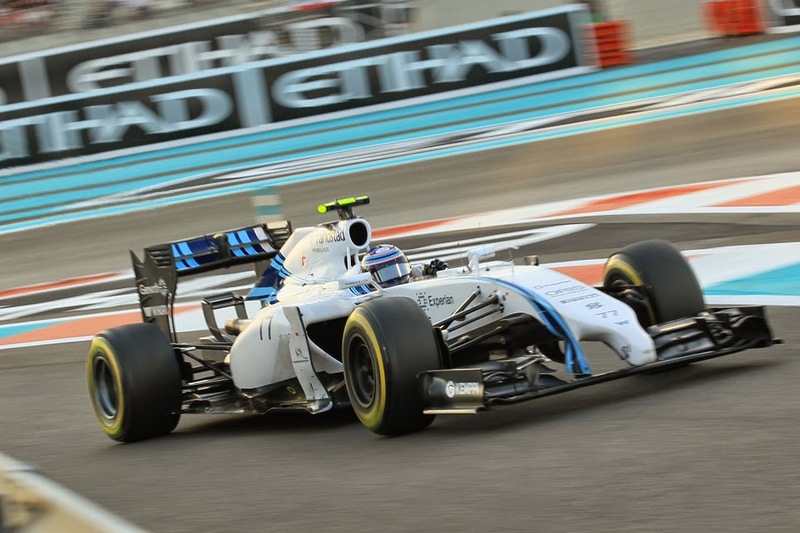 The Yas Marina track is one on which he specialises, and it looked that way again. In Friday practice he was king, and while Nico sudden pulling out of a time three-and-a-bit tenths quicker than Lewis's in Saturday morning's FP3 put a timid kitten among the pigeons, come the qualifying session it seemed order had been restored. Lewis was quicker in Q1 and set a mark a whole half a second under Nico's best in Q2. But Q3 is the thing, and therein Nico whizzed around first with a 1m 40.697, almost six tenths under anything he'd done before. And whether related or not Lewis suddenly got scruffy, locking a wheel on two on the way to cutting the beam some three tenths over Nico's time. Then in the final runs Nico found more with a 1m 40.480, and once again Lewis's brakes seemed a little grabby at the same moment. While he improved his time the gap to Nico's raised bar remained similar. Second place was all he could muster. It seems another recurring theme of the year too, that at the vital part of qualifying small, sometimes nearly imperceptible, errors can creep into Lewis's repertoire. Whether due to tightening up at the crucial moment or not. As Martin Brundle wondered when the guns fell silent today it would be fascinating to see his comparative telemetry of Q3 and, say, the quali simulation in FP3 where he usually excels, particularly on braking pressure. Nico meanwhile, as an admiring Mark Webber watching on noted, 'nailed it'. Again. And the demeanours on show in the post-qualifying press conference appeared to betray the respective pressure situations of the two Merc pilots. Nico all smiles, excited chatter, even cracking jokes. Lewis meanwhile with an extreme economy on his prose and animation. Nico therefore reflected Damon Hill's words noted at the outset literally as well as metaphorically. Yet for Lewis, in yet another recurring theme, he can draw succour from the names roll off the tongue - Austria, Britain, Hungary, Japan, America - of races this campaign wherein Lewis has endured a difficult qualifying, even on occasional outwardly close to down and out, but overnight regrouped and been magical come the race. You wouldn't bet a penny against similar happening again this time. 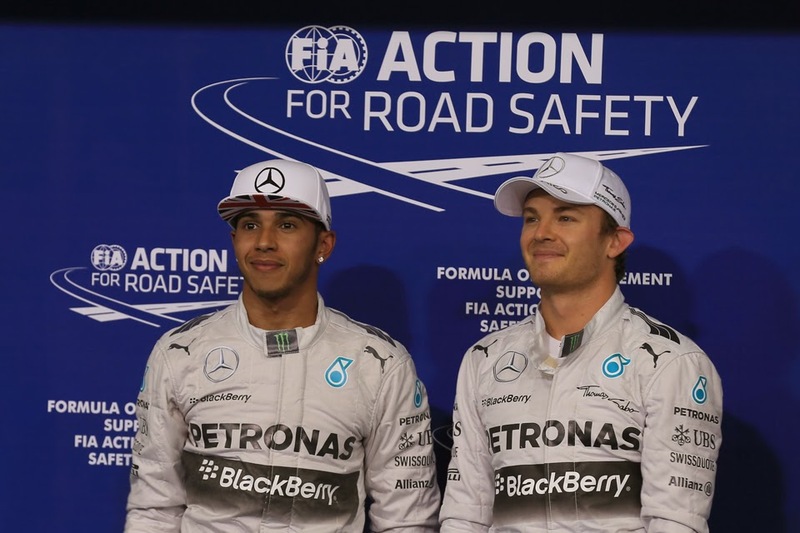 Niki Lauda indeed promised that while Lewis will be 'upset' right now, tomorrow he - as will Nico - be 'reset'. And of course Lewis doesn't have to beat Nico tomorrow, but therein lies a lot of Lewis's conundrum. As Brundle noted in previous weeks 'Lewis doesn't do second very well'. And his previous attempts to go against his instincts and drive within himself in a title showdown have been borderline-painful. Possibly reflecting this Lewis reiterated once again today that there will be no change to his usual approach. And the probability surely remains with him. As previously argued, and whatever his difficulties today, only the unusual can deprive him of the title. One thing that Nico has been hoping for is other cars getting between him and his title antagonist. From Friday practice that looked a long way off, there then being almost eight tenths per lap to the first one not in silver. But the rest got a bit closer to today, particularly in the hands of Valtteri Bottas. Indeed in his final run he lit the timing screens purple in the first two sectors, but it was not enough to split the haughty Mercs even before they set their own final times. 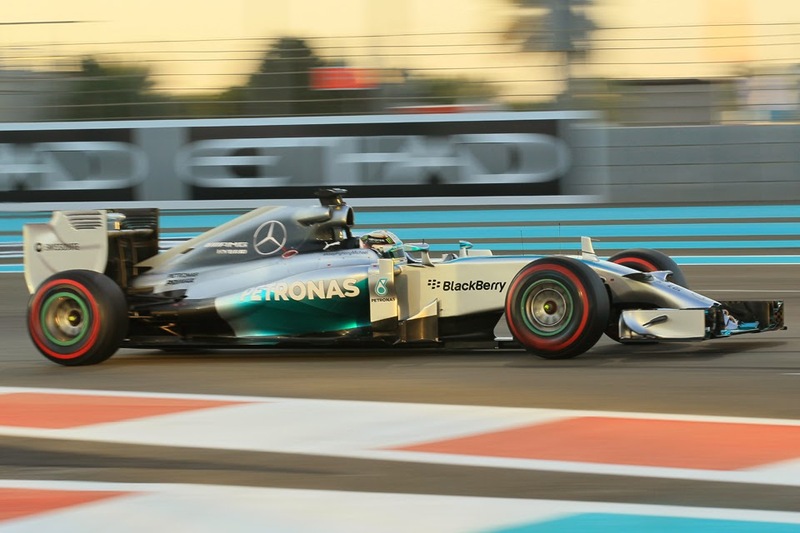 It remained close however, and in the final shake out Bottas was within two tenths of Lewis. Felipe Massa was next up, followed by the once-again mighty Daniel Ricciardo - who was almost unnoticed in setting a mark upwards of half a second under that of his team mate Sebastian Vettel, who nevertheless starts one place shy in sixth (there is though some possible trouble brewing for the Bulls due to front wing flexing...). Daniil Kvyat, who of course if to partner Ricciardo in Vettel's stead at Red Bull next year, signed off from Toro Rosso in style with P7, his best lap extremely close to Vettel's mark. Jenson Button was next up in P8, no doubt with his future still in the balance taking no pleasure from once again getting one up on his young team mate, followed by the Ferraris, Kimi Raikkonen ahead after Fernando Alonso erred on both of his Q3 laps. It's ironic that even now the persistent discourse of this campaign's intra-Merc title fight is that Lewis is the one with the raw pace and Nico is the cerebral one - perhaps showing the sport's weakness of framing all battles as akin to Senna vs. Prost. But its suitability herein has been limited as for all that some seem determined to typecast Nico, and for all that the wins ratio of the two is touted, in 2014 the German has been the qualifying master, today winning his 11th pole position to Lewis's seven. A ratio almost as impressive as Lewis's advantage on victories. F1 in more than one way has stepped through the looking glass in 2014. Looking ahead to when it really matters tomorrow Nico noted: 'I need to get the job done...I'm sure it's going to be a great battle between the two of us, and then of course I hope for more than that...some sort of help from Lewis or anything...'. Kind of sums the thing up. Lewis as outlined is in the box-seat, wherein only the unusual will take the title away from him. But there was something very usual as far as this year is concerned about today's qualifying. Nico on top, and striking back just when we started to venture that he was dealt with. Doing everything that he can. And refusing to go quietly.